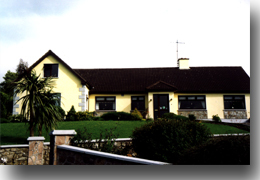 Cnoc-na-ri, Cnoc-Na-Ri Country Home is situated in the heart of the Nire Valley, one of the most beautiful, unspoiled places in Ireland. Hidden in the Comeragh Mountains, it has its natural scenery and breathtaking landscapes. The excellent choice for your walking holiday. Walking right from our doorstep. For all our walkers, we provide packed lunches, maps and walking sticks. For the golfing enthusiast, there are six superb golf courses within 20 minutes drive. Horse riding at our local equestrian if you wish to view the Nire Valley on horseback. Fishing in the Nire river and the Suir River. Fishing permits are available locally. You can tour the South East at you leisure or just relax in our natural gardens and enjoy the serenity of the Nire Valley. All our rooms are ensuite, spacious and luxurious, with TV, tea/coffee, spare blankets etc. We also have a large dining area.